How to dimension an arc and circle? 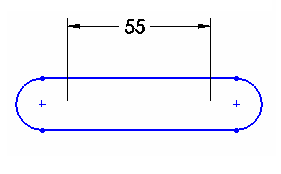 The Dimensions conditions are described below. 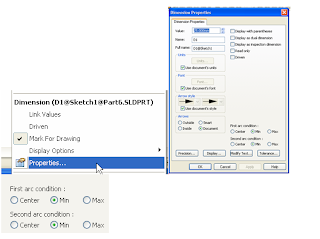 Center-Center: The default in solidworks when an arc is selected. Here the dimensions are attached to the center points of the arc. Minimum Distance:The dimensional point is to the closest point on the arc on the same diameter of the center as the other end of the dimension. Linear dimension does not cross arc centerpoint. Maximum Distance: Dimensional point is to the farthest point on the arc on the opposite side as the other end of the dimension. In this Case linear dimension crosses the arc centerpoint. 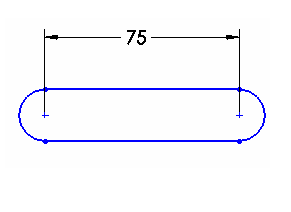 Selecting an arc as part of a linear dimension causes the dimension to default to the center arc condition. However, if the Shift key is held down as the arc is selected for a linear dimension, the arc condition will be minimum or maximum, whichever is closest to the side being selected. Further, the arc conditions of a dimension can be changed after the dimensions is created. Right-click on the dimension, select Properties, and change the arc condition by selecting the new option near the bottom of the dialog box. Note that there can be two arc conditions to control if the linear dimension is between two arcs.